New York Film Academy offers both 12-weekend filmmaking and acting for film camps during the school year at our New York City and Los Angeles campuses, as well as 3D animation and graphic design weekend camps in the New York City location only. Designed for teens (ages 14-17) who are driven to learn more about the performing and visual arts, the weekend camps offer students a unique opportunity to explore filmmaking, acting for film, 3D animation and graphic design in a supportive and professional environment. Each camp is taught by our faculty of active industry professionals, which consists of award-winning filmmakers, actors, and animators who are able to relay their extensive experience in the entertainment industry to students who are eager to learn. The camps are structured around the Academy’s philosophy of “learning by doing,” meaning that students learn filmmaking, acting, 3D animation and graphic design through making films, acting on camera, animating objects and characters, and creating designs, hands-on. The weekend camps meet for 12 sessions on Saturday afternoons from 2-6 p.m. in New York City and from 10 a.m.-1 p.m. in Los Angeles during the regular school year. Learn more about each camp below. From smartphones to the increasing affordability of HD video cameras, filmmaking is becoming more and more accessible to high school students, and students are learning filmmaking skills either by themselves or in special classes. The Academy’s 12-Weekend Filmmaking Camp was created to immerse both budding filmmakers as well as those who are interested but have no prior experience with filmmaking in the many facets of the craft. From day one, students are behind the camera learning how to operate industry–standard equipment, using HD digital video cameras, professional lighting gear, and industry–standard editing software to create their own original scenes and films. Students are introduced to the different disciplines that comprise filmmaking, including directing, screenwriting, editing, cinematography, and producing, through hands-on workshops and exercises that teach students the fundamentals of each. Over the course of the 12 weekends, students work towards creating their own original short film while also serving in a variety of crewmember positions on classmates’ films. There is also a second-level 12-Weekend Filmmaking II Camp for teens, available for students who have completed the first level camp, where returning students create a longer, more complex film and are introduced to green screen equipment and special effects. 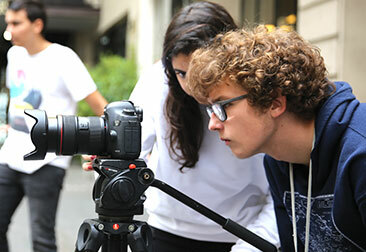 To learn more about the 12-Weekend Filmmaking Camps for teens and get information on the tuition rates and dates, please click here. Many students who come to NYFA to study acting for film have had a taste of the craft by performing in a high school production or in community theater. However, many do not have experience acting on camera, a skill that differs from the stage greatly and should be learned through hands-on experience and instruction. The 12-Weekend Acting for Film Camp at the Academy’s NYC and LA campuses provides the ideal platform for students to make the progression from stage to screen. Students begin with receiving an introduction to the fundamentals of acting and gradually move from the stage to the screen, with class exercises being professionally filmed and critiqued. At the end of the camp, students leave with an understanding of various acting techniques, an ability to perform repeated takes on set, and a deeper appreciation for the craft. Students will leave with recordings of their on-camera work, which will consist of audition monologues, scenes, and/or short films depending on the camp. 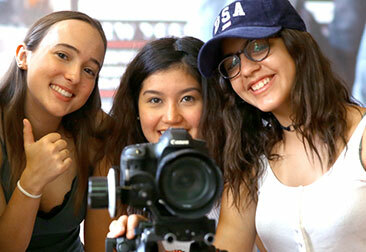 Returning students who have completed the 12-Weekend Acting for Film Camp will be given more complex and specific material to cater to their experience level and type in the second-level 12-Weekend Acting for Film II Camp for teens. Click here to learn more about the 12-Weekend Acting Camp for teens. With the opportunity to write, direct, animate, and edit their own 3D animated short films, the 12-Weekend 3D Animation Camp for teens is a creative experience like no other, offering aspiring animators unparalleled opportunities to learn the vital skills and tools of their craft hands-on. Over the course of 12 weekends in New York City, students review the history of animation and the traditional animation pipeline, also learning the foundational techniques used in modeling, texturing, and animating both characters and environments. The course focuses on storytelling through the audio-visual medium of 3D animation, using industry-standard software and latest generation Apple computers. Click here to learn more about the 12-Weekend 3D Animation Camp for Teens. The New York Film Academy 12-Weekend Photography Camp gives teens interested in visual art the chance to explore digital photography under the guidance of active professionals. Held during the school year for 12 consecutive Saturdays, our teen photography camp teaches students the hands-on skills needed to research, compose, capture, and refine digital photographic projects. Classes offer both lectures and demonstrations from professional photographers to enrich campers’ experience of working, professional-grade studios. Weekend photography campers explore a full repertoire of light and shadow techniques with professional lighting, grip hardware, strobe lighting, and unconventional practical sources of light and shadow. Photography weekend camp students learn through experience, from professional techniques in practical labs to field trips to photograph a variety of locations and subjects. In every project, they use industry-standard digital imaging software. Throughout the course of the 12-weekend camp, students will present their work in class and create a body of photographs of which they can be proud. Click here to learn more about the 12-Weekend Photography Camp for Teens.